COLUMBIA, SC (WIS) - South Carolina celebrities are doing their part to help the Palmetto State in the wake of October's devastating floods. 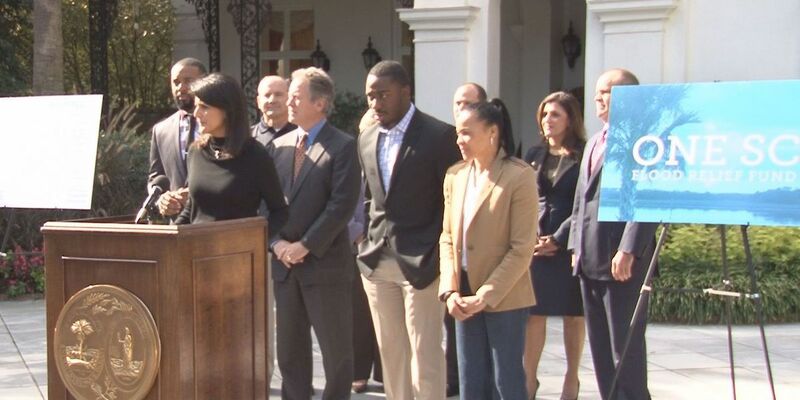 During a Monday morning press conference at the Governor's Mansion, Gov. Nikki Haley announced an advisory committee called "One SC" will take part in a flood fundraising effort. The program is all about home repair and long-term flood relief, Haley says is not really addressed by FEMA or non-profit assistance. Haley promises that all funds raised through One SC will go straight to supplies or assistance, which she says is possible because her charitable foundation, The Original Six Foundation, is covering administrative costs. "There is an underwriting cost," Haley said. "What we did with the Original Six foundation is we're underwriting the operations, because I want every donor to know the money that you're giving is going straight to rebuilding, it's going straight to supplies to get those done. What they'll be doing is putting that in grant form so the nonprofits can do the work they need to do." RELATED: Check out photos of October's devastating floods. The full committee consists of several well-known South Carolinians such as Stephen Colbert, Darius Rucker, Craig Melvin, Marcus Lattimore, and former Gov. David Beasley. "This is another opportunity as South Carolinians to show the country how strong we are," Lattimore said. Colbert is no stranger to fundraising in the Palmetto State, funding $800,000 in grants for South Carolina teachers in May. Rucker has also given back to his home state, leading fundraisers for the Medical University of South Carolina's children's hospital. October's unprecedented 1,000-year flood displaced tens of thousands of South Carolinians from their homes. State agencies are still calculating the cost of damage done to the state.